Let us say that one consistently goes to sleep at the same time every day, and sets an alarm for the same duration of sleep 7 hours and 45 minutes (e.g., 10:45pm to 6:30am). One day, they get caught up in something, and are 30 minutes late to "bedtime." Is it better to wait 45-60 minutes to wake up at the same time (at the end of a cycle), refreshed, and not in the middle of a cycle, groggy? As a precursor, even if a stringent sleep schedule is absolutely followed, one still needs to practice other good sleep hygiene habits: avoiding blue light (or using a filter for screens), exercising regularly, eating healthy and attaining an overall equanimous mood (lack of distress). That, among other non-ideal factors, such as sleep disturbances could also result in a poor nights sleep. But the question was stated as if in a 'perfect vacuum.' Non-idealities are overlooked. That being said, I am going off the aforementioned assumptions about religiously going to bed at 10:45 and waking at 6:30 every day--including weekends. Let's say this person could sleep for nine hours (9:15 TIB), and we can safely assume that an adequate nights sleep is 7:45 TIB. In other words, this person can be high-functioning on 7.5 hours of sleep (five phases). → Is it better to wait until 12:15? (Either way, 6:30 wakeup for work stays constant.) One deviant day--does it matter? When will the sleep debt be relinquished? Honestly, I didn't find any research remotely about it. Let's go out on a limb, and say it doesn't matter given the ideal-vacuum conditions. Then how many deviations, say, twice a week--do matter? How many will lead to partial sleep deprivation? Still, the answer is unknown. I have question for you about making a bedtime choice, a deviation, from a consistent sleep schedule: For an average adult, in general, if one knows they will wake up in the middle of a cycle--is it better to go to bed later? Get home late, and ready to be in bed at 11:15 PM. Must wake at 6:30 for work. Get home late, later, and ready to be in bed at 11:45 PM. Must wake at 6:30 for work. The first is 30 minutes late. The second is 60. Let's say for this person that we can safely assume that an adequate nights sleep is 7:45 TIB. In other words, this person can be high-functioning on exactly 7.5 hours of sleep (while following a consistent sleep/wake routine). → Is it better to wait until 12:15? [...] I ask this question because I follow the routine above. I deviate 1-2 times a month, and either way usually take a nap before 3PM to follow, but persistently wonder which is the ideal choice. 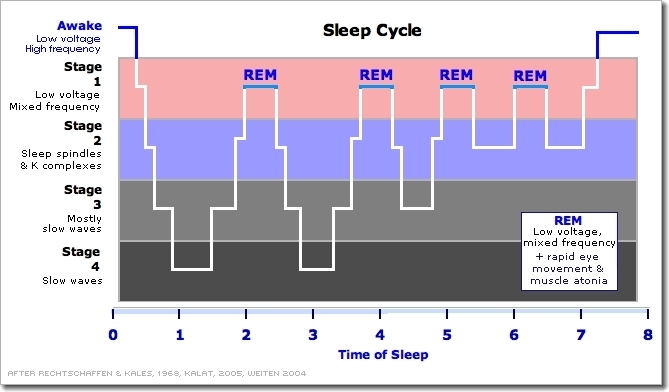 How do you objectively analyze your sleep? There are two commonly used methods to assess sleep, Actigraphy and Polysomnography. Actigraphy is a non-invasive method of monitoring sleep and involves wearing wrist activity monitors, which are devices worn like a wristwatch that continuously record body movement (usually stored in 1-min epochs). [...] Actigraphy is useful for understanding sleep patterns as it is non-invasive and relatively easy to collect data over significant periods of time (commonly two weeks of monitoring). The second method is Polysomnography (PSG) which is a sleep study in which body functions such as EEG, eye movements, muscle activity and cardiac activity are measured. PSG provides information on sleep staging and is considered the “gold standard” for assessing sleep quality and quantity. As your contacts have already pointed out, there is no research on this specific question. But from what I have observed (both in patients with sleep disorders with whom I have been working as well as in healthy subjects), it is most likely that someone who has been following the same bed and wakeup routine for a month or longer will wake up at their usual time regardless of where they are in their sleep cycle, if they go to bed at a different time only once. And that's the whole point of regular bed and wakeup times in sleep hygiene: those routines remain relatively stable, once they have been established, even in times of stress or other – temporary! – interferences. Only when the sleep routine is consistently eroded (or the deviation from the regular bed time is large), will wakeup times begin to shift significantly. You may notice that if you go to bed half an hour later than usual, that you wake up a little tired or a little on the late side of your usual range of wakeup times. What I have noticed is that people who go to bed a little later than usual may find that they have trouble falling asleep! Because when they remain awake beyond the point where their body had prepared them for sleep, their body will begin to rouse them again, "thinking" the person needs wakefulness. So it might actually take you until the next phase to fall properly asleep and you'll be sleeping rather restless until then, if you sleep at all. But this, as I said, is observation over a small sample and not generalizable. Not the answer you're looking for? Browse other questions tagged sleep performance or ask your own question.